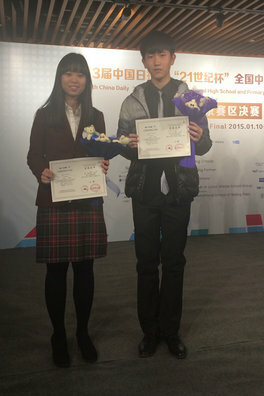 On January 11, 2015, CHEN Duping and WANG Xiaochen, from International Department of Beijing No.80 High School, won the first and third prize in the Beijing’s finals at the 13th China Daily "21st . Lenovo" National High School Primary School English Speaking Competition. They participated in the finals with a full heart and made outstanding performance. The first "21st Cup" National High School and Primary School English Speaking Competition was organized by China Daily, the most eminent English newspapers in China, in 2002. Being the only qualification phase in China of the International English Speech Competition hold in London annually, this competition has been known for its unparalleled academic status and regarded as the most sweeping one in China. The Thirteenth China Daily "21st . Lenovo" National High School Primary School English Speaking Competition was started in November in 2014. 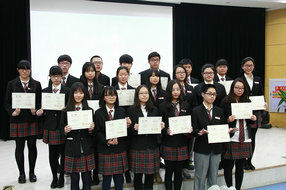 Twenty-five students from International Department of Beijing No.80 High School participated in the semi-final in Beijing, hold on January 1st, 2015, and they all made excellent performance. CHEN Duping (10-A1) and WANG Xiaochen (11-B1) achieved Grand Prize in semi-final, reaching into the Bejing’s final. Besides these two students, other students achieved prizes in Beijing semi-final: Chang Xiaotian (10-A2), Ma Yizhe, Zhang Yuanrui (10-A1), Wang Yi, Zhu Yufan (11-A1) won the first prize; Liang Huimeng, Hu Ziyue (10-A2), Chen Xiaoyao, Leng Zhongyu, Wang Peixin, Xie Yumeng (10-A1), He Kedi (11-A1), Gao Yunfei, Gu Yuzhe, Ke Ai (10-B1), Liu Ting and Zhao Jing (11-B1) won the second prize; Jiang Jiawei, Liang Yuxuan, Xie Ziyu (10-A1), Ding Zhaoxian (11-A2), Gao Weiqi (10-B1) and Peng Chuling (11-B1) won the third prize.